7 Kids and Us: Sick of only having one free arm while holding an infant? Check out my Review of Hotslings and Giveaway! Sick of only having one free arm while holding an infant? 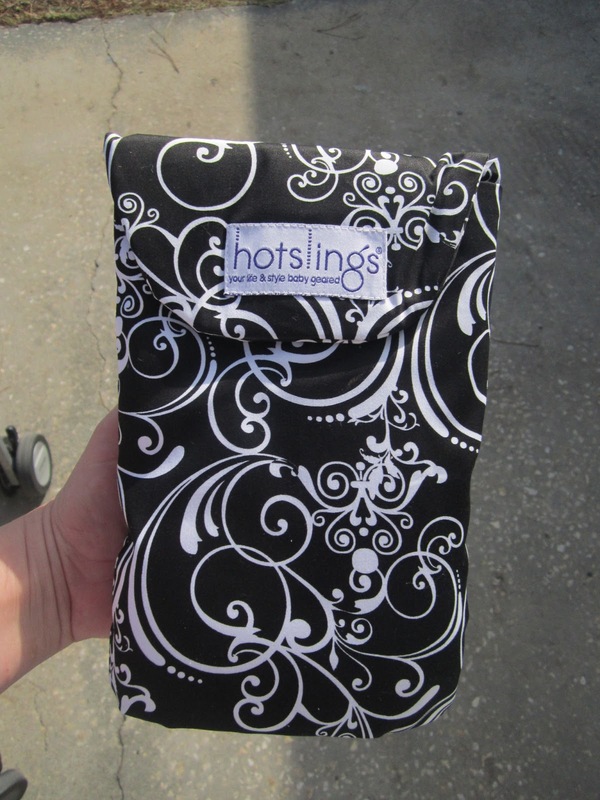 Check out my Review of Hotslings and Giveaway! I hate to carry things. I don't know the last time I owned a purse. 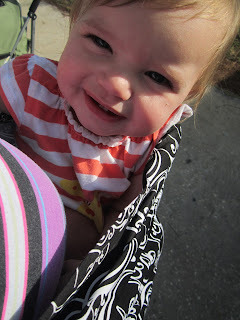 My purse is a backpack, so the last thing I want do is carry around my infant on my hip. I need my hands to grab the other 4 running around, I got that with Hotslings which I can place Sarah in and she is right there with me. Sarah has many times where she wants to be up and with me. It's not easy to find the time when you have 4 others who are very mobile all over so she also can get overwhelmed with her brothers and sister knocking her over. I love the Hotsling, it is very simple to use. I have had a few different carriers in the past and well I opened it looked at it and donated because it was complex looking. I love how Hotslings says this end out from shoulder, has a more padded area so you know that babies head should be in this area. 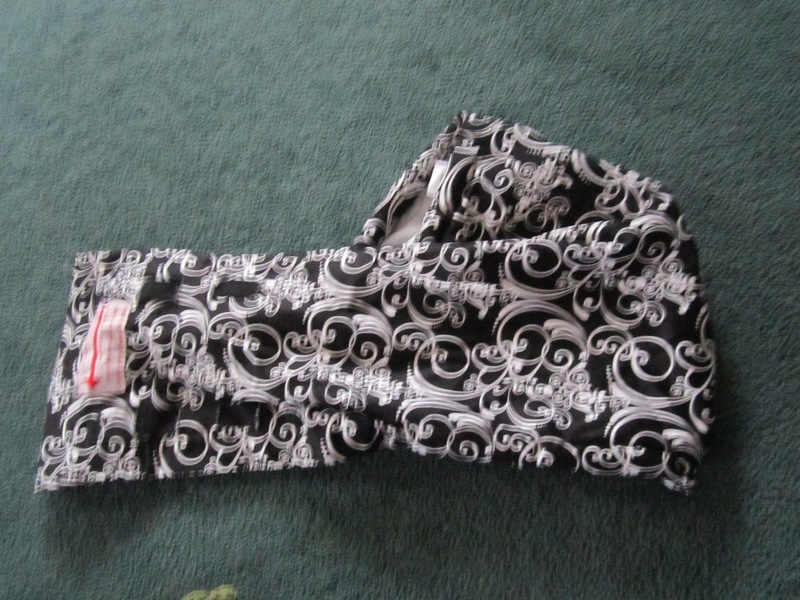 Other bags like this are place your baby in and hope you have it correct which um....NO! I love the color. I am a simple mom, I am not one to like to stand out even though it's hard not to when you have 5 kids around but the less that is known the better for me. 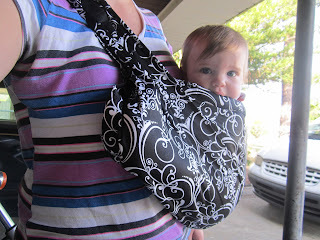 I like how soft it is, and how lightweight it is as well which it comes with a cute bag that you can fold it up into and store in any diaper bag or medium size purse. 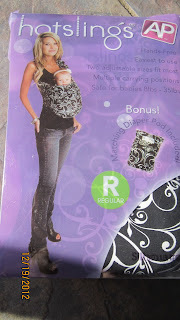 The Hotsling bag can be placed over your shoulder, then you fluff out and place your child in it. It holds up to 35lbs. Sarah is 10 months old and fits in great. She loved being close to me and able to do what I was doing. I took her for a walk in it a few times and I saw her playing the bag like clapping her hands and playing with her feet. These bags are a busy on the go mom must have, it's great for you to bond better with your child as well as giving them more options to move around and not always in a stroller or carseat. You can purchase a Hotsling at this link here. They are priced at $64.95. The Hotsling comes in many color options which fit your personality. 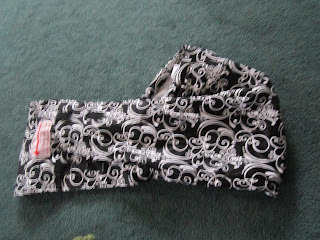 They come in 2 sizes Regular which fits shoulder to hip 23" to 26" or Large which fits 27" to 30" this would be for more bigger breasted women. I like that I know my daughter is safe while in the Hotsling unlike most infant carriers your always checking to make sure they are not overheated or not getting air because to tight a space. The Hotsling has easy adjustable straps in the back or you which work like a backpack just loosen or tighten for a better fit. Its that simple! Once you receive your Hotsling if you still are not getting how to place it on yourself you can click this link which shows every point on which the sling should be on you. Safety for your child, infant is Hotslings priority so if you need help their site has answers so you're 100% satisfied and happy with your new Hotsling. How cool Hotslings is now gonna host a giveaway! Enter to win your own Hotsling through the rafflecopter below, contest open to U.S. residents only, Ends 2/5/13. Disclosure: I was given a Hotsling to help with my review. All opinions are 100% mine. AP Moonlit Sky... LOVE IT! I love the Moonlit Sky. Its just my style. AP Silhouette is my favorite pattern/color. I would choose the Overcast. I would choose Barely Square..so cute!